The second Cabot (CVL-28) was laid down as Wilmington (CL-79), redesignated CV-28 on 2 June 1942 renamed Cabot 23 June 1942, converted while buildingand launched 4 April 1943 by New York Shipbuilding Co., Camden' N.J.; sponsoredby Mrs. A. C. Read; reclassified CVL-28 on 16 July 1943; and commissioned24 July 1943, Captain M. F. Shoeffel in command. Cabot sailed from Quonset Point' R.I.' 8 November 1943 for Pearl Harbor,where she arrived 2 December. Clearing for Majuro 15 January 1944, she joinedTF 58 to begin the consistently high quality of war service which was towin her a Presidential Unit Citation. From 4 February to 4 March 1944 shelaunched her planes in strikes on Roi, Namur, and the island strongholdof Truk, aiding in the neutralization of these Japanese bases as her partin the invasion of the Marshalls. Cabot returned to Pearl Harbor for a brief repair period, but was backin action from Majuro for the pounding raids on the Palaus, Yap, Ulithi,and Woleai at the close of March 1944. She sailed to provide valuable aircover for the Hollandia operation from 22 to 25 April, and 4 days laterbegan to hurl her air power at Truk, Satawan, and Ponape. She cleared Majuriagain 6 June for the preinvasion air strikes in the Marianas, and on 19and 20 June launched sorties in the key Battle of the Philippine Sea, thefamous "Marianas Turkey Shoot," which hopelessly crippled Japanesenaval aviation. 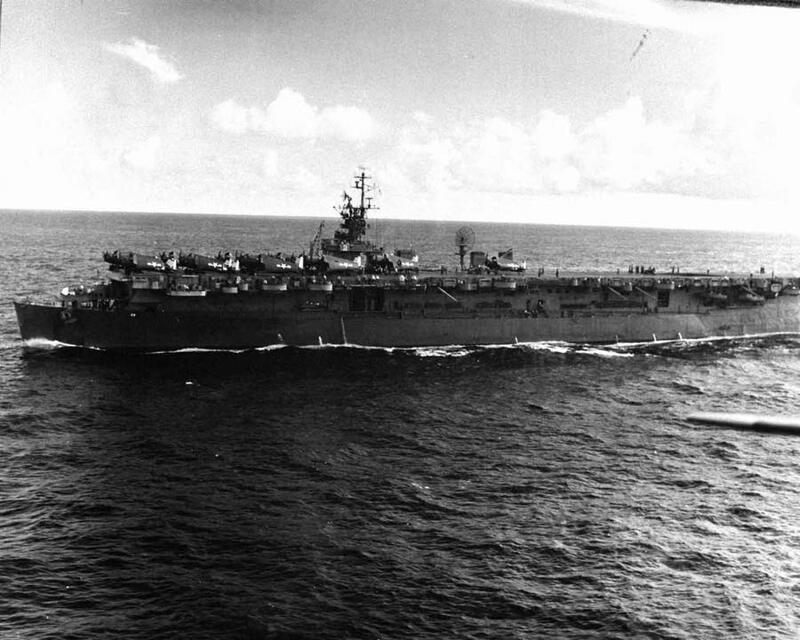 Cabot's air units pounded Japanese bases on Iwo Jima, Pagian,Rota, Guam, Yap and Ulithi as the carrier continued her support of the Marianasoperation until 9 August. Preinvasion strikes in the Palaus in September 1944 along with air attackson Mindanao, the Visayas, and Luzon paved the way for the long-awaited returnto the Philippines. On 6 October Cabot sailed from Ulithi for raids on Okinawa,and to provide air cover for her task group during the heavy enemy attacksoff Formosa on 12 and 13 October. (Cabot joined the group which screened"Cripple Division 1," the cruisers Canberra (CA-70) and HoustonCL-81) which had been torpedoed off Formosa, to the safety of the Carolines,then rejoined her group for continued air strikes on the Visayas, and theBattle for Leyte Gulf on 26 and 26 October. Cabot remained on patrol off Luzon, conducting strikes in support ofoperations ashore, and repelling desperate suicide attacks. On 25 Novembera particularly vicious one occurred. Cabot had fought off several kamikazeswhen one, already flaming from hits, crashed the flight deck on the portside, destroying the still-firing 20 mm. gun platform, disabling the 40mm. mounts and a gun director. Another of Cabot's victims crashed closeaboard and showered the port side with shrapnel and burning debris Cabotlost 62 men killed and wounded, but careful training had produced a crewwhich handled damage control smoothly and coolly. While she continued tomaintain her station in formation and operate effectively, temporary repairswere made. On 28 November she arrived at Ulithi for permanent repairs. Cabot returned to action 11 December 1944, steaming with the force strikingLuzon, Formosa, Indo-China, Hong Kong, and the Nansei Shoto in support ofthe Luzon operations From 10 February to 1 March 1946, her planes poundedthe Japanese homeland and the Bonins to suppress opposition to the invasionof Iwo Jima. Continued strikes against Kyushu and Okinawa in March preparedfor the invasion of the latter island. After these prolonged, intensiveoperations, Cabot was homeward bound for San Francisco for a much-neededoverhaul completed in June. After refresher training at Pearl Harbor, the carrier launched strikeson Wake Island on 1 August while en route to Eniwetok. Here she remainedon training duty until the end of the war. Sailing 21 August, she joinedTG 38.3 to support the landings of occupation troops in the Yellow Sea areain September and October. Embarking homeward- bound men at Guam, Cabot arrivedat San Diego 9 November, then sailed for the east coast. Cabot was placedout of commission in reserve at Philadelphia 11 February 1947. Recommissioned 27 October 1948, Cabot was assigned to the Naval Air Reservetraining program. She operated out of Pensacola, then Quonset Point, oncruises to the Caribbean and had one tour of duty in European waters from9 January to 20 March 1952. Cabot was again placed out of commission inreserve 21 January 1965. She was reclassified AVT-3 on 15 May 1959. In addition to the Presidential Unit Citation, Cabot received nine battlestars for World War II service.